Few products have been hyped as much as Apple's new G5 range of 64-bit personal computers — but how good are they for making and recording music in the real world? According to Apple's publicity, their new G5 is both the world's first 64-bit personal computer, and the fastest personal computer on the planet. Both of these claims have been challenged in PC circles, but what is clear is that the G5 is a massive step up from the previous G4 range, and that the combination of IBM's PowerPC 970 processor and Mac OS X at least provides stiff competition for cutting-edge Wintel machines. Whichever platform is currently ahead in the absolute speed stakes, the situation will probably continue to reverse every few months, so absolute speed is not the only concern. There are other reasons to buy a Mac, such as its elegant operating system, the predictability and consistency of the hardware, and the cool design; and, of course, Windows PCs have their own attractions, such as lower cost and a wider user base. The important questions don't concern exactly how many more audio tracks or reverb plug-ins you can squeeze out of a G5, but how well it functions in its practical role at the heart of a studio. The G5 processor itself is already available at speeds of up to 2GHz, and Apple are promising to have a 3GHz version within a year. However, there's far more to the new range than faster clock speeds. 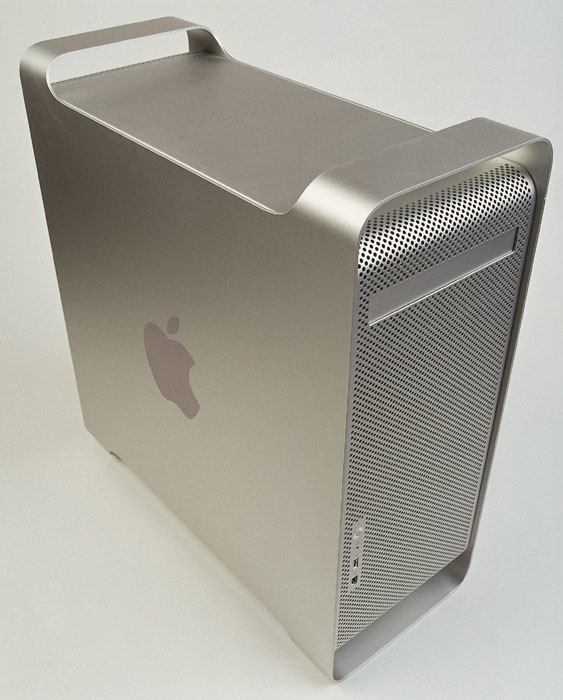 Whereas both the G4 and Intel's Pentium 4 are 32-bit processors, the PowerPC 970 is a 64-bit device that can theoretically address 4 terabytes of physical memory; and though neither Mac OS X nor any applications are fully 64-bit native at present, the G5 can run 32-bit code natively, without having to use an inefficient emulation mode. The PowerPC 970 chip also includes the 'Velocity Engine' originally developed for the G4 chip, so Altivec-optimised programs will still benefit from the speed increase. Photo: Mike CameronOther aspects of the G5's design are equally cutting-edge. The older Parallel ATA buss used to connect hard drives has been replaced by two independent Serial ATA busses, supporting a data throughput of up to 1.5Gbps per channel, which should mean significantly more audio track playback capability. To increase the rate at which data can be fed to and output from the CPU, the system features a new front side buss that can run at up to 1GHz (the two dual-processor models in the range have one for each processor). There's a 400MHz, 128-bit memory buss, and a new standard called Hyper Transport for connecting the system controller to the PCI controller and I/O subsystems. Except in the 1.6GHz bottom-of-the-range single-processor machine, old-style PCI slots have been superseded by the new PCI-X standard, which can operate at up to 133MHz compared to the previous limit of 33MHz, on two independent PCI busses that don't share bandwidth. Doesn't NuBus seem such a distant memory now? 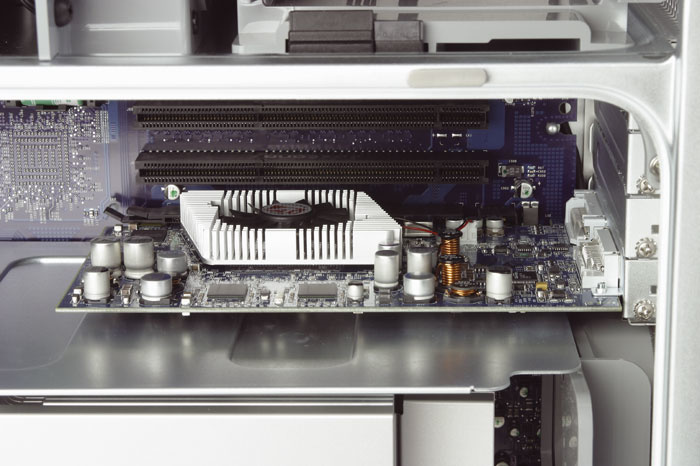 Of course, greater power comes at a compatibility cost, and many older PCI cards won't work in either the new PCI-X slots or the old-style PCI slots on the 1.6GHz G5: see the box on page 131 for more details on this situation. The connectivity options build on what was available to G4 users, so now we have Firewire 800 as well as Firewire 400 and USB 2.0 instead of USB 1.1. USB 1.1 devices can still be used, but the new Firewire 800 ports can't be used to connect older Firewire 400 devices. The video display card is fully digital, offering a choice of ADC or DVI outputs, though Apple include an adaptor to allow VGA monitors to be used via the DVI port. Dual-monitor support comes as standard, though you'll need an additional adaptor if you want to use two of Apple's swanky cinema displays. Another welcome addition is digital audio in and out (in optical S/PDIF format), so if you have digital peripherals with optical digital connectors and only need stereo-in, stereo-out operation, you can get to work without buying any additional audio hardware. Analogue stereo audio I/O, which was omitted from many G4 models, has also now returned. The G5 includes both analogue and optical S/PDIF audio I/O, as well as a range of connectors including USB 2.0, Firewire 400 and 800.Photo: Mike CameronIn keeping with long-established Apple policy, there are three basic models in the G5 range, although you can choose to vary the specifications using their build-to-order service. The entry-level G5 has a single 1.6GHz processor, an 800MHz front side buss, and 256MB of 333MHz DDR memory upgradable to 4GB. An 80GB ATA drive comes as standard along with a 4x-speed optical DVD-R Superdrive that reads and writes both CD-Rs and DVD-Rs. This model, which is around £900 less costly than the top-of-the-range G5, has three standard PCI slots running at 33MHz and ships with a 64MB GeForce FX 5200 Ultra graphics card. For an extra £400, you can opt for the 1.8GHz dual-processor model with its two slightly faster (900MHz) front side busses, 512MB of 400MHz DDR memory upgradeable to 8GB, and 160GB Serial ATA hard drive. This time the slots are PCI-X (one at 133MHz and two at 100MHz), and the same Superdrive and graphics card are fitted as to the 1.6GHz model. Top of the range is the dual 2GHz machine with 1GHz front side buss, 512MB of 400MHz DDR memory upgradeable to 8GB, and a single 160GB Serial ATA drive. Again there are three PCI-X slots, one at 133MHz and two at 100MHz, and this time the video card is a 64MB ATI Radeon 9600 Pro. We were lent the top-of-the-range dual 2GHz G5 for this review. The test model had 2GB of RAM installed, but was otherwise as standard. Unfortunately, deadlines meant that my tests had to be conducted with the older Mac OS 10.2.7 ('Jaguar') rather than the new 10.3 'Panther'. The starkly beautiful case is made from aluminium, an extremely good conductor of heat, so the case itself is used to move heat away from hot spots by conduction as well as the more usual fan cooling. 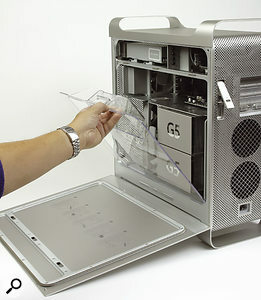 Computers have always had a bad reputation for being noisy, especially the silver-door G4s, which whined like a hairdressing salon on a Saturday afternoon, but Apple have made a very serious attempt to keep the G5s quiet, a feat that seems all the more impressive when you realise there are nine fans inside the box! The secret is to use intelligent fan speed control so that the fans only turn up the wick when the temperature rises — the rest of the time they swoosh gently around like something out of a Ridley Scott movie. 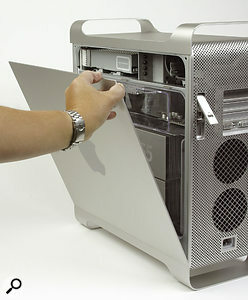 Despite the clean design, the front panel nonetheless manages to conceal the optical drive as well as USB, Firewire and headphone connectors.Photo: Mike CameronAccess to the innards is via a pull-off side cover that is secured by a recessed latch on the rear panel. Removing the panel reveals a perspex cover, which may be unlatched and lifted out to provide full access through the side of the machine. If you do this when the machine is switched on, the fans rev up to full power like a Matrix hovercraft! The innards of the machine also look sharp and well-organised compared to earlier models and have been designed to allow additional drives and RAM chips to be fitted without the need for any tools at all. There's space inside to fit one additional hard drive, with cables already fitted, but because the G5 employs the new Serial ATA standard, you can't simply whip a Parallel ATA audio drive out of a G4 and transplant it — and in any event, both the connectors and the drive mounting system are different. If you want to use an older ATA drive with your G5, you'll need to buy an external Firewire drive housing and connect it that way. 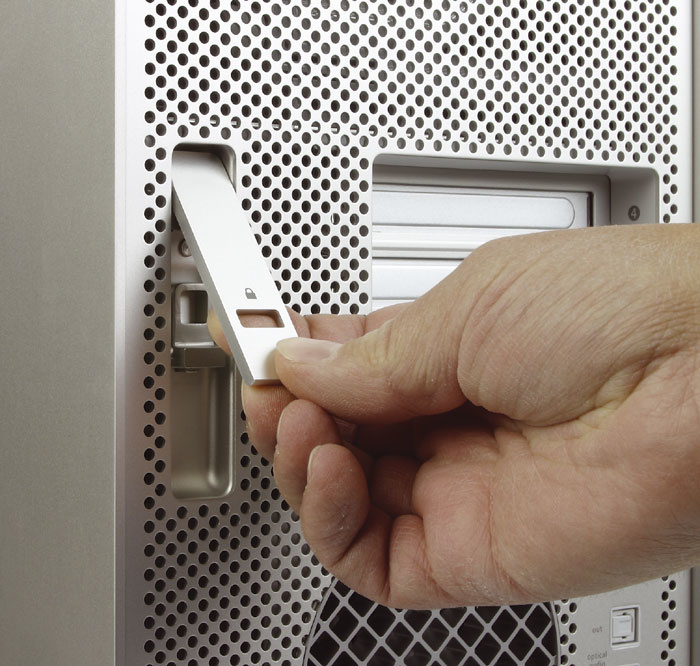 Rather than fixing into place with four screws, hard drives are installed by sliding pegs on the sides of the drive into plastic guide rails, after which a plastic toggle is rotated to lock the drive into place. On the dual 2GHz model I tested, there were eight memory slots, and on all G5s these have to be filled in pairs — two of the review system's slots were filled with 1GB DIMMs, for a total of 2GB of RAM. 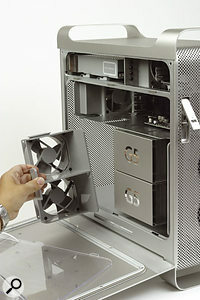 A fan assembly has to be removed to get to the memory slots, but the whole fan assembly simply slides out without the need for tools, so the only time you should need a screwdriver is when fitting the crosshead screws (the ones that always fall down into the computer's innards!) needed to hold PCI cards in place. 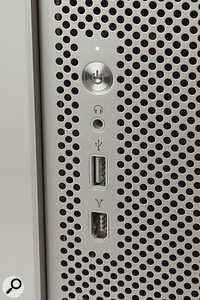 The rear panel of the computer reveals the two video connectors (ADC and DVI) on the rear of the AGP slot video card, analogue speaker and mic connections, the optical digital I/O, and sockets for Gigabit Ethernet and a telephone modem connection. 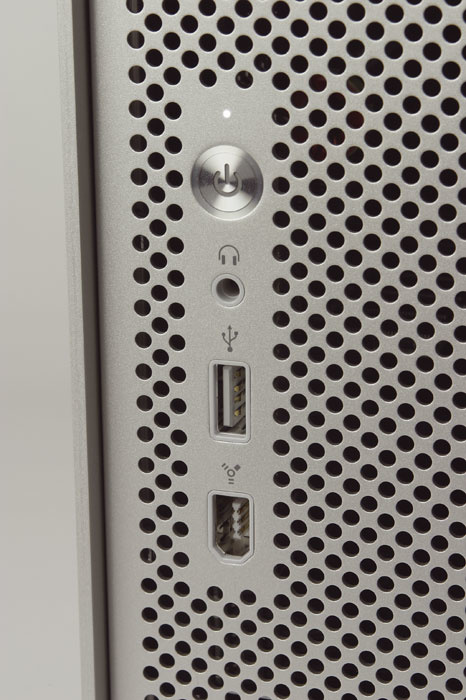 There are two USB sockets on the rear along with one Firewire 400 and one Firewire 800 socket. Two large fan outlets and an IEC mains connector are in evidence, along with sockets for Airport and Bluetooth antennae. If this seems a little on the sparse side in some respects, that's because you get a further USB and Firewire 400 connection on the front panel along with a headphone jack. This is very practical for connecting 'visiting' peripherals without having to crawl around the back of the machine with a torch! When I turned on the G5 for the first time, I was particularly interested in how noisy it would be in my own studio, as I'd previously only seen them at trade shows where the ambient noise level is fairly high. I currently use an earlier 800MHz G4, which is very reasonable in the noise department, despite the horrendous reputation of some later models. The G5 starts with a flurry of fans that immediately settles back into a gentle whisper, leaving the whine of the hard drive as the loudest audible component of the sound. There's still more noise than you would want to share a room with if recording something sensitive, but in most instances, setting the mic up at the other end of the room and pointing it away from the computer should suffice. If you stand the computer under your desk rather than next to your ears, the noise level is low enough that it shouldn't prove a distraction when monitoring unless you happen to be monitoring extremely quietly. I've also checked out a couple of other G5 dual-processor machines that seem to be significantly quieter than the one I had for test, so maybe there is some variation in the types of drives fitted? My first task was to install new OS X drivers for my MOTU 828 Firewire interface, so I downloaded 6.5MB of installer from MOTU's web site, which took around an hour on my steam-powered dial-up modem. It turned out that this must be unstuffed using Stuffit Expander version 8 or later — you can unstuff the file in OS 9 using any version of Stuffit Expander, but if you do, OS X sees the file as an unknown document and refuses to play ball with it. So, I spent another hour downloading Stuffit Expander 8, unstuffed the installer on the G5, and everything went swimmingly well. Most pre-G4 Apple computers had line-level audio input and output at quality that was often surprisingly usable, and this has made a welcome return on the G5. The subjective quality of the inbuilt audio seems really very good and monitoring from the output jack sounded identical to what I was hearing from my 828. In fact I had to double-check that the monitor output really had changed! However, on closer listening with the track not running, some digital crosstalk was evident at higher monitoring levels, so the audio out isn't as noise-free as a serious external interface, but it should be perfectly adequate for many monitoring uses. The provision of the optical S/PDIF input and output is also very welcome, and will mean that many users won't require an additional soundcard or interface at all, providing they don't need to record or play more than two tracks at a time. Note, however, that Core Audio doesn't support the use of two different devices at once, so you can't use the built-in I/O to provide extra input or output channels when you are using another interface. A single catch on the rear releases the G5's side panel...Photo: Mike CameronSome benchmarks show the fastest G5 outgunning a dual 3GHz Pentium 4 by up to 35 percent, while others suggest that the Pentium has the edge, but this type of "My Dad is bigger than your Dad!" rhetoric has to be kept in perspective, as what really matters is the overall experience of running our favourite music applications and plug-ins. What's more, because the G5s (like the later G4s) can only run Mac OS X, you have to ensure not only that your main audio applications are OS-X-compliant, but also that all the your favourite plug-ins are too. The majority of plug-ins are finally becoming available for Mac OS X, though not always in Audio Units versions that can be used directly within Logic and other AU-reliant programs. There are 'wrapper' programs around that allow some OS X VST plug-ins to run as Audio Units, but success is not guaranteed in all cases. ...which then swings down to provide access to the interior.Photo: Mike CameronHaving explained that benchmark figures shouldn't become the only thing to rely on when choosing a computer, I was naturally interested to obtain some quantitative results running music applications. 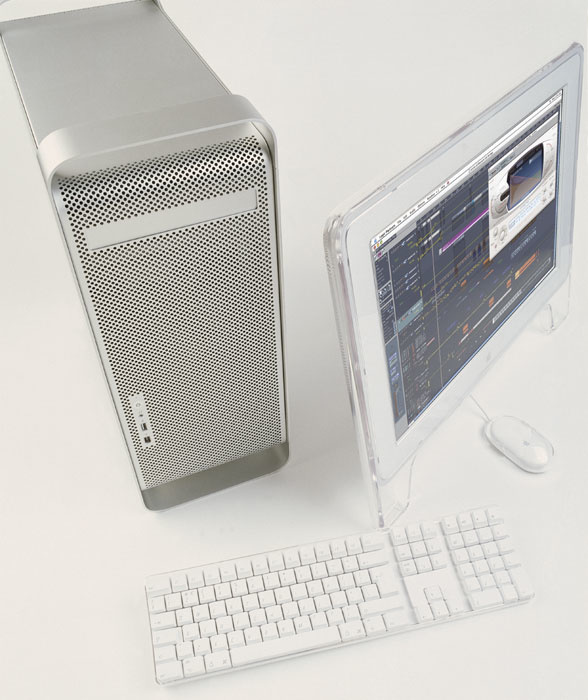 Since both the G5 and my existing 800MHz G4 were running the same versions of Mac OS X (10.2.7) and Logic (version 6.3), there was a reasonably level playing field on which to carry out comparative tests. 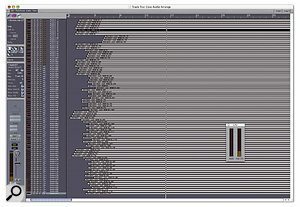 In both cases, Logic's Larger Disk Buffer was turned off, its Process buffer was set to Medium, and the same MOTU 828 interface was used to record 24-bit, 44.1kHz audio via a 128-sample audio buffer. 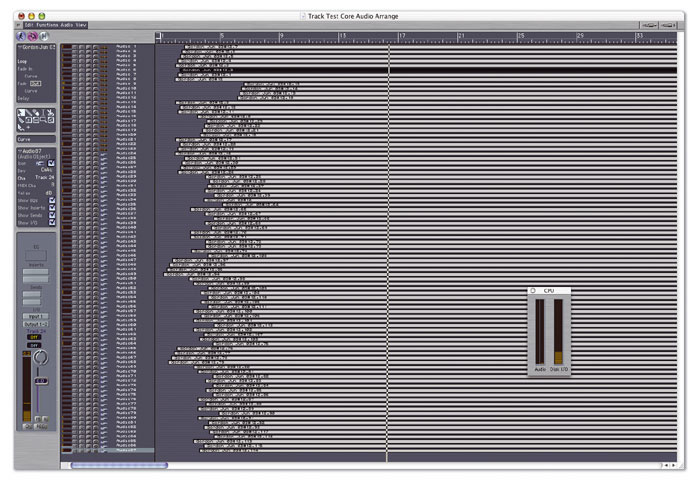 To provide a sensible track count figure, I've decided to quote the number of mono playback tracks at 24-bit, 44.1kHz that result in a 50 percent disk activity reading, as this leaves sufficient safety margin for a realistic amount of editing and looping. Using the primary internal drives in both cases, my G4 800MHz ran up to around 40 tracks and the G5 80 tracks at this nominal 50 percent capacity; placing an edit across all the tracks increased disk load by around 10 percent. A further panel made of moulded plastic helps to direct the flow of air from the cooling fans...Photo: Mike CameronMusicians often compare the CPU muscle of different systems by seeing how many reverb plug-ins they can run before the activity 'LED' goes into the red, and I decided to run this test using Emagic's new Space Designer sampling reverb. Like all convolving algorithms this is a pretty CPU-intensive plug-in, and using a patch with a two-second decay time, a mere two Space Designers registered around 95 percent CPU load on my G4. With the same patch, the G5 ran 32 instances! The CPU activity meter readings seemed fairly accurate, because loading on a couple more instances on the G5 pushed it over the edge, and lengthening the decay time on the G4 instances by a few percent brought the system to a halt. The extreme discrepancy in performance in this case is probably due in part to the fact that Space Designer is one of few applications currently optimised for the G5. The G5's superior memory bandwidth, as well as its greater CPU horsepower, should be noticeable with applications such as soft samplers, so I decided to compare the maximum polyphony using a RAM-based program (rather than samples streamed from hard drive) in Emagic's EXS24. There was an obvious improvement, but nothing like as great as with Space Designer; my G4 800 just managed 150 voices, while the G5 delivered around 400 to 450 voices. 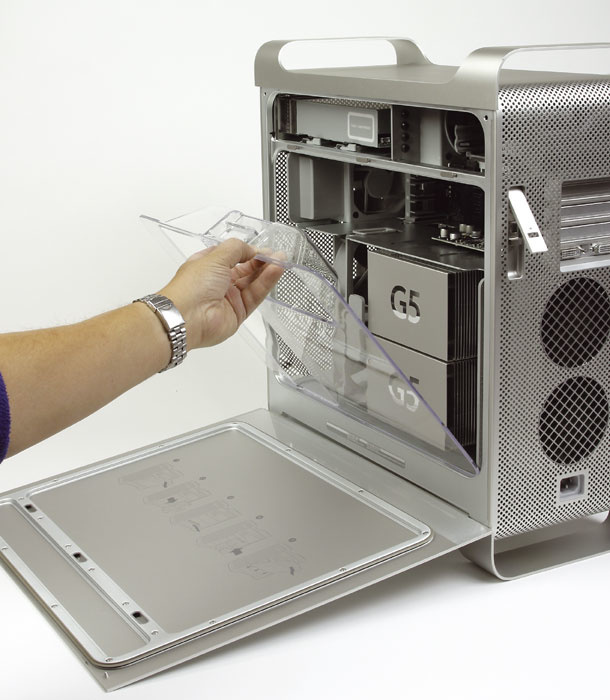 ...two of which slide out to provide access to the G5's memory slots. 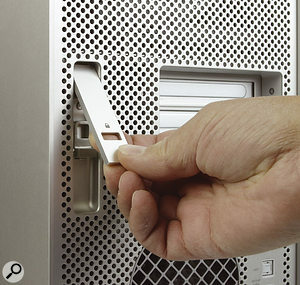 Additional drives and memory can be installed without the need for any tools. Photo: Mike CameronFrom these tests, it seems that the performance gains vary depending on the area you test. For example, scaling up my G4 800MHz EXS24 sampler polyphony to what you might expect on a 2GHz G4 machine (if there was such a thing) shows that the increase in EXS24 polyphony offered by the G5 is pretty much in line with its faster clock speed, with few obvious benefits from the second processor or faster bussing. On the other hand, the increase in the number of Space Designer reverbs that can be run simultaneously can't be accounted for by clock speed alone, so the G5's architecture clearly offers significant advantages where plug-ins are designed to take advantage of it. While I've never even approached the maximum track count capability of the my G4, the G5's new Serial ATA drive clearly delivers around double the performance I was getting from my own machine, which could be useful when you use lots of stereo/surround tracks or high sample rates, or when other demands on the system, such as sample streaming, are hogging resources. This also suggests that for most real-world projects, creating an audio partition on the existing internal hard drive should deliver more than enough performance — and if it doesn't, adding a second Serial ATA drive and using software RAID to stripe data across them will deliver many more tracks. Logic and the G5 make short work of 87 tracks of audio...Computers are relatively inexpensive considering what they can do, and they offer tremendous power and creative potential, but in no way can they ever be considered an investment other than in the amount of work they can do for you during the time you own them. Fast though the G5 is, you just know that in two or three years' time, you'll be wondering how to fund the upgrade to Apple's new gleaming, ultraviolet, pyramid-shaped G6 or the G7 levitating silver sphere. Computing power continues to double every 18 months or so in accordance with Moore's Law, which means obsolescence is an unavoidable part of buying into any computer platform, but having said that, the G5 represents a very big jump in performance for most users. Not only does the G5 provide Mac users with a very significant power hike, it is also very cheap for what it delivers. Even the top dual-processor model costs around 30 percent less than my old Mac SE30 with its monochrome 9-inch screen, 20MB hard drive and 4MB of memory cost me in the mid-'80s! It also comes with stereo digital I/O and dual monitor support as standard, is much quieter than the previous Apple G4 machines and it looks fantastic! The ability to support up to 8GB of RAM is good news for those using large sample libraries, and the faster internal drives should increase the number of available audio tracks. DVD and CD-R burning is built in, so there are no backup problems and the only restriction, if this still applies to you, is that you no longer have the option to run 'proper' OS 9. Classic Mode is included, of course, but although this runs OS 9 word processors and so on, it's useless for most music applications. There's also the issue of the 3.3V PCI slots, and many Mac users migrating to a G5 will need to budget for upgrading or replacing their audio interfaces. Nevertheless, the G5 definitely has that 'I must possess it!' factor. M-Audio already have Panther-compatible drivers for their entire range, and are redesigning their PCI cards to be compatible with the G5's PCI-X architecture. They have also announced an upgrade plan for users with older cards who are migrating to a G5. The cards being updated are the Audiophile 2496 and Deltas 44, 66, 1010 and 1010LT, and the company promises that the new versions being introduced will be fully backwards-compatible with the old PCI standard and with all Windows machines. If you bought your card after August 1, 2003, upgrades are free, while European users with older cards will need to find 50 Euros plus $40 shipping; the upgrade will cost US owners $50 plus $5 shipping, while Canadians will pay $50 (US dollars) for the new card and $40 shipping. For details, see http://m-audio.com/ news/php/g5compatibility.php. As reported in October's Pro Tools Notes, most recent Digidesign cards will work in 3.3V PCI slots, including Accel, HD Core, HD Process, Mix Core and Mix Farm cards. The Digi 001 is incompatible, as are all Pro Tools III and Pro Tools 24 cards (including the DSP Farm card supplied in Mix Plus systems), Samplecell, Audiomedia III and Project cards. All Digidesign systems will require a software update before they will work on the G5, and new software versions are currently being rolled out, with the compatible version 6.2r2 for HD and Accel systems available now. At the time of writing, these only work under Mac OS 10.2.7 and 10.2.8, but Panther-compatible versions are due soon. Emagic's Audiowerk8 and Audiowerk2 PCI cards are among those that will never work in the G5, but their USB products should work with the G5 and Panther. Edirol have made Panther-compatible drivers available for all of their products that were already compatible with OS X. The only PCI card product in their range is the DA-PCI used to interface the DA2496 eight-channel converter. At the time of writing, a beta OS X driver for this product is on their site, but the DA-PCI card is not compatible with the 3.3V powering implemented in the G5. All of RME's current PCI audio cards are compatible with the G5, and their current driver versions work under Panther. However, some older cards are either incompatible or in need of a firmware upgrade. Hammerfall DIGI 9636 and DIGI 9652 revision 1.1 cards, manufactured from 1999 to April 2001, are not Mac-compatible at all, and never will be. Revision 1.5 and 1.6 versions of these cards shipped between June 2000 and December 2002, and DIGI 96 cards from these dates, are also problematic, as some of them "included a PCB error, making them incompatible to PCI-X slot computers". Anyone with one of these cards should contact RME or their local distributor to have it checked and, if necessary, modified. MOTU's Digital Performer sequencer has been updated to version 4.1 and is now fully compatible with the G5 and the Panther operating system, as are the Audiodesk multitrack recorder and Mach Five soft sampler. On the hardware front, all MOTU Firewire interfaces are now compatible with the G5, thanks to the updated driver mentioned in the main text. All of MOTU's other interfaces connect to the host computer via their 424 or 324 PCI card. A new 424/G5 version of the former is now available and is, as the name suggests, compatible with the G5, but owners of older 424 and 324 cards will need to sign up to MOTU's upgrade plan. If you bought a 424 card after July 1, 2003, the upgrade is free; otherwise, it costs £65 including postage and packing to upgrade from a 424 to a 424/G5, and £249 to upgrade from a 324 to a 424/G5. TC Electronic's Powercore PCI and Firewire are both fully compatible with the G5. Universal Audio's promised OS X support for their UAD1 card is still in the beta stage at the time of writing, but the company say that when available it will be fully compatible with Panther and the G5. Echo have Jaguar-compatible drivers available for all their PCI and PCMCIA products, but it's not clear which of their PCI cards will work in the G5s; nor is it clear whether the current OS X drivers will work under Panther. Aardvark's existing PCI-based audio interfaces have no OS X support and are not compatible with the G5, but the company are currently putting the finishing touches to a new G5-compatible card with OS X drivers. ST Audio are promising a new product range early next year that will be compatible with the G5. Their current DSP2000 system has OS X drivers, but it's not clear whether this will work with the G5's 3.3V PCI slots. Less costly than previous generations of Apple computer. Significantly more powerful than the G4 range. Much quieter than the G4 range. Irresistible styling, both inside and out. Upgraded in many areas — not just processor speed. Only runs OS X and Classic Mode. Older PCI cards that require 5 or 12 Volt signalling won't work in any of the G5s. If there was ever a reason to move everything to OS X, the G5 has got to be it. Finally I can say this is the only computer I will ever need — for at least another 18 months! 1.6GHz £1399; dual 1.8GHz £1899; dual 2GHz £2299. Prices include VAT. Apple Store +44 (0)800 039 1010.